I haven’t done an updated skincare routine in a really long time so today, I thought I would show you guys how I look after my skin. NB: I realize these pictures are dreadful, and I am looking to purchase a new camera, however I am still saving and I’ve lost the charger to my old camera so please bear with me! I promise it will be better soon. If I can be bothered, (which admittedly is most of the time, as I really enjoy taking my make up off in the evenings), I use the L’Oreal Skin Perfection 15 Second Miracle Cleansing Oil. I have nearly used all of this up now so I feel in a pretty good position to tell you guys what I really think. 1. What I do, is I take about 2-3 pumps of the oil on my CLEAN hands (I have an obsession with washing my hands. its weird.) and I rub the oil together on my fingertips and then apply it to my face, when it is completely dry. After I have massaged it in, I take some warm water and rinse it off thoroughly. When the oil touches the water it emulsifies, and turns into a milky consistency. If I was wearing particularly heavy makeup, then I might repeat this, to ensure my face is makeup free! 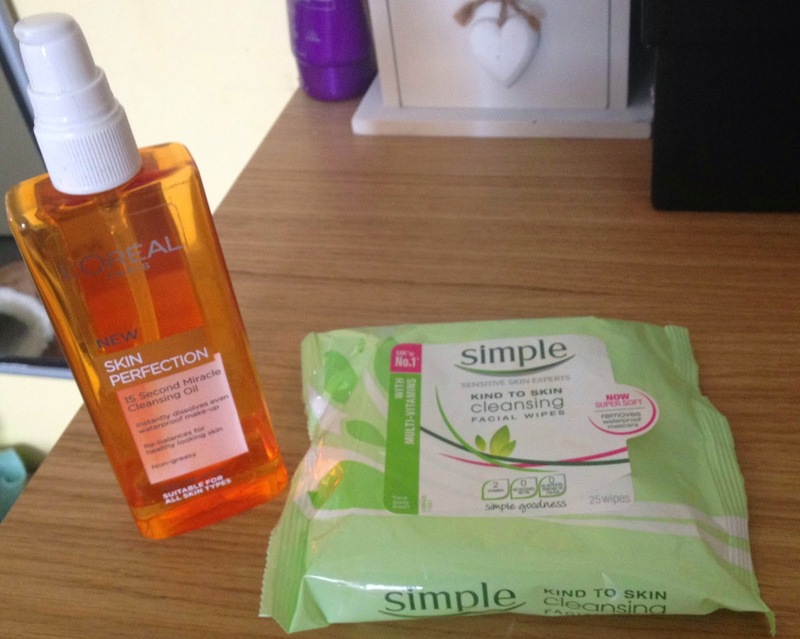 If I am feeling lazy, or I haven’t worn much makeup, then I go for Simple Kind to Skin Facial Cleansing Wipes. There’s not really much to say about these, but I like that they don’t irritate my skin, they are really soft, and they remove makeup really well. If you are a makeup wipes kind of gal, these are a definite must try! In the mornings, I don’t use the cleansers, as I don’t have any makeup on, and I shower every morning without fail. (No shower in the morning = unhappy Lauren) When I am in the shower I like using the Clean & Clear Morning Energy Skin Energising Daily Facial Wash as firstly the smell is so refreshing and it really wakes me up, but also as it has little beads in it, which burst as you massage them into the face, and I find it makes my skin look brighter, and it doesn’t leave my skin feeling tight. I also love the packaging, as it comes in a pump which is really convenient, and especially in the mornings, it comes in tres handy! 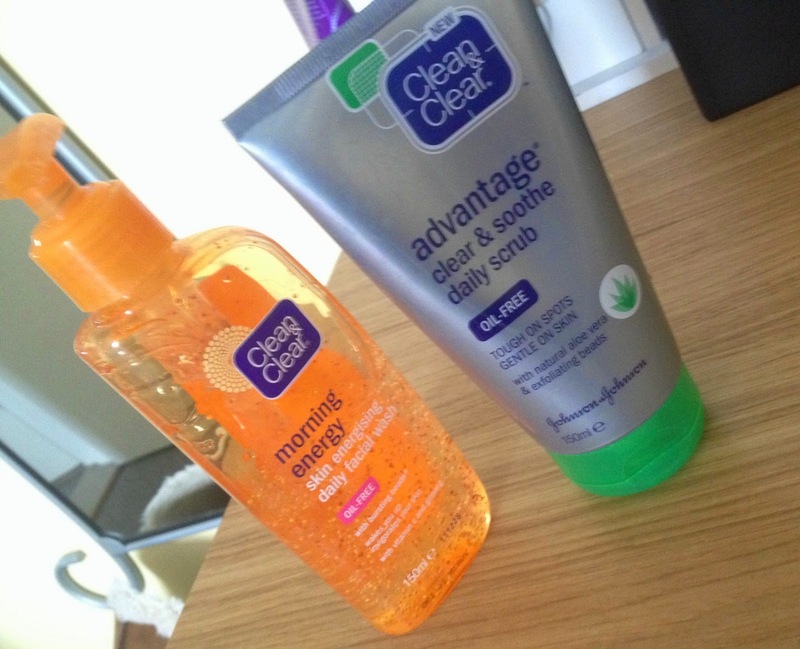 At night times, after cleansing my face, I like to use Clean & Clear Advantage Clear & Soothe Daily Scrub because it is a gentle exfoliator and it really soothes my skin down. Also as it has extracts of Aloe Vera in it, it helps to calm redness and combat breakouts. After I have gotten out of the shower, or finished washing my face, I use Superdrugs Pore Cleansing Pads and I really enjoy using them. You take out one pad, and rub the textured side all over your face, and then flip the pad over to the smooth side, and go over your face again. These ensure my face is really free of all the makeup and grime of the day, and also really work well at cleaning my pores. They are really inexpensive as well, so I would give them a try if you suffer from clogged pores, or Acne, as they contain Salicylic Acid to fight breakouts as well. After that has dried, I moisturize using Simple Kind to Skin Light Hydrating Moisturizer. This is my holy grail moisturizer and I love it. It isn’t scented so doesn’t irritate my skin, and It dries really quickly, and it leaves my skin feeling so soft and hydrated. I love this! So thats it for my skincare routine! About 2 times a week I like to use a facemask as well, but I was thinking of doing a separate post on that sometime in the near future. Hope you liked the post, and as always, if you have any questions, please leave a comment! Previous Post Long Time, No Speak.